Born: 14 December 1827, Norrk�ping, �sterg�tland, Sweden. Died: 30 June 1908, Notteb�ck, Kronoberg, Sweden. Gustav de Vylder learned several languages from his mother. Forced to leave school at the age of twelve for financial reasons, he was employed as a tutor in a wealthy home. He qualified as a land surveyor and spent some time surveying and mapping, but his main interest from a young age was entomology. As a student of the (Swedish) Academy of Fine Arts he learned wood-engraving and became an excellent draughtsman. From 1844 to 1871 he worked for publishers in Stockholm, illustrating and engraving scientific works. A man of many talents, he trained as a photographer; wrote songs, at least one of which became popular; published poetry, a novel, and several plays; had some of his comedies performed on Stockholm stages during the 1850s and 1860s; wrote and illustrated children's books, mainly about animals; wrote articles for the popular press; kept live animals; assembled a collection of insects; and worked as an unpaid assistant for the Riksmuseum. In 1871, with financial help from the Swedish government, he undertook a journey to the Cape of Good Hope and German South West Africa (now Namibia) to collect natural history specimens for Swedish museums. Leaving Sweden on 9 July and collecting at various places along the way, he arrived at Cape Town early in November 1871. He collected in the vicinity for more than a year - mainly insects, spiders, birds, reptiles, and some plants - before sailing to Port Nolloth in March 1873. From there he travelled via Warmbad and Windhoek to Omaruru, collecting at many places along the way. With an interest also in geology, he may have been the first to collect fossil plants (at Aub, near Keetmanshoop) in Namibia. At Omaruru in July he met the trader and naturalist Axel W. Eriksson*, who assisted him. With Omaruru as base he undertook three collecting and trading journeys in north-central Namibia, keeping a diary all the while. 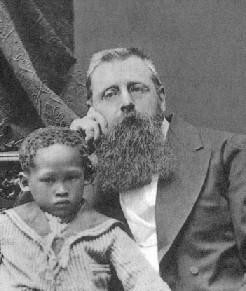 He returned to Cape Town from Walvis Bay in March 1875 with a waggon load of collections of natural history specimens and ethnographic material, accompanied by a small Bushman boy which he had adopted. In May he left Cape Town for Sweden, where he was granted an audience with King Oscar and was elected a member of the Anthropological Society in November. However, his collections were not bought by the government. He donated a large collection of insects to Uppsala University, and made various donations to the Riksmuseum and to school museums. Eventually, in July 1876 the Riksmuseum bought some of his remaining collections. In October 1879 de Vylder left Sweden again for a second visit to southern Africa, particularly keen to visit Lake Ngami, and arrived in Cape Town on 8 December. Lack of funds prevented him from travelling far and he remained at the Cape for eight years, making substantial collections of insects and writing poetry and light literary works. After his return he spent the rest of his life mainly in the village of Notteb�ck in southern Sweden, continuing his studies in natural history. The Natural History Museum in Gotheburg received a collection of butterflies from him, while his ethnographic collection is housed in the Folkens Museum in Stockholm. After his death a valuable collection dating from his second visit to South Africa was presented to the Swedish Royal Academy of Science. De Vylder was a kind and helpful man who had many friends, though in his diaries he quite frequently criticized others and was particularly scornful of the English. He bore a grudge against the Swedish scientific fraternity for their lack of support, which probably resulted from his lack of formal scientific education. He was, however, an informed, observant, and meticulous collector. Brinck, P. Swedish exploration of South African animal life during 200 years. In B. Hanstrom, P. Brinck, & G. Rudebeck (eds), South African animal life: Results of the Lund University Expedition in 1950-1951 (Vol. 1, pp. 11-59). Stockholm: Almqvist & Wiksell, 1955. The journal of Gustav de Vylder, naturalist in South-West Africa (translated by I. & J. Rudner). Cape Town: Van Riebeeck Society, Second Series, No. 28, 1998.